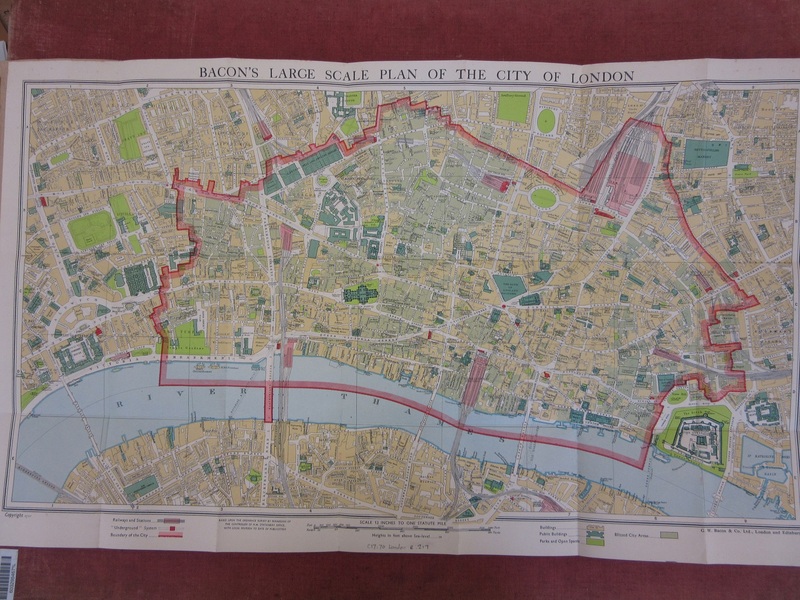 This new addition to the collection is a large-scale general tourist map of central London. 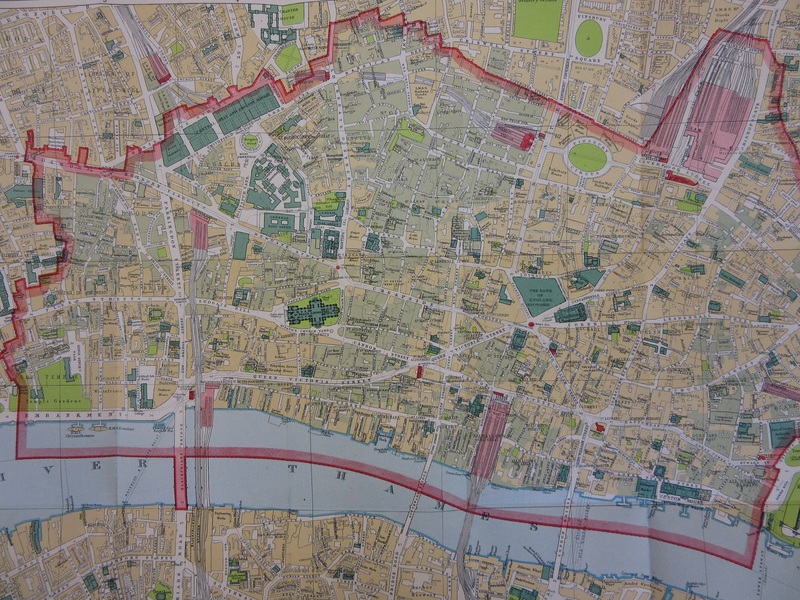 Almost as an aside the map shades the areas in the city damaged or destroyed by the blitz. This close-up of the area of the City shows how much damage was caused by raids between 1939 and 1945 which hadn’t been re-built by the time of the publication of the map in 1947. The damaged areas are shaded light green. By the end of the war nearly 3000 buildings in the City had been destroyed, with 340 killed. In the London region the amount killed was close to 30,000. 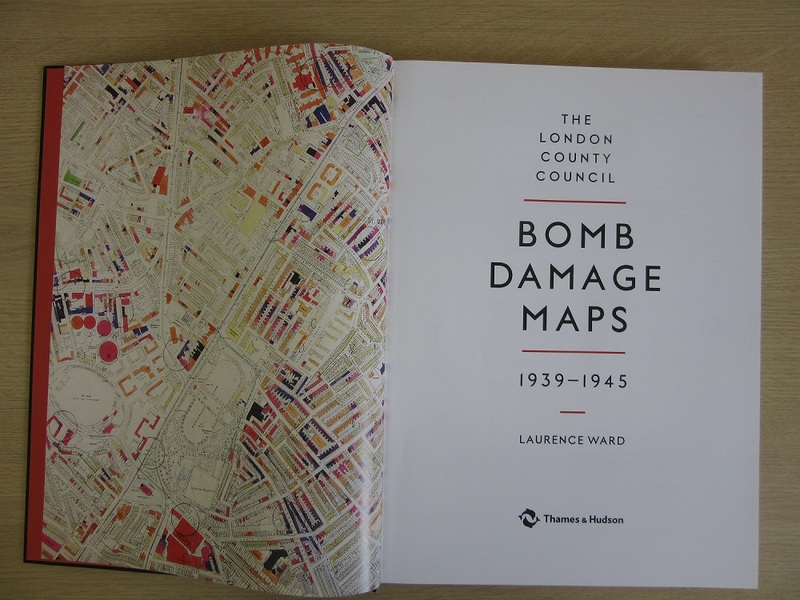 There is an informative book on the open shelves in the reading room, Bomb Damage Maps 1939-1945, by Laurence Ward and published by Thames & Hudson, which reproduces the maps created by the London City Council to show the areas of damage. Using County Series Ordnance Survey maps from 1916 the maps have been shaded in showing the levels of damage caused. This entry was posted in History, Military on 15 July 2016 by stuart. 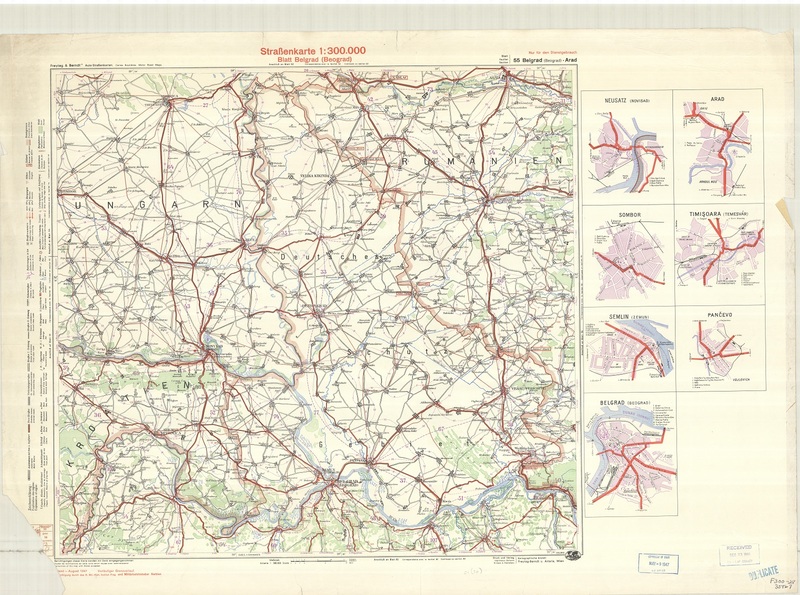 First produced by the Austrian map publisher Freytag & Berndt as one sheet in a road map series of Europe in the 1920’s the map has then been overprinted by the Military Command of the German Army occupying Serbia in August of 1941. This is a rare example of a map produced by the German Army during World War II where they have overprinted an existing commercial map, as opposed to printing their own work. ‘Corrections of this map with thanks accepted’, a message also in French and German above the overprint by the German military indicates that the map was originally published for an international market. presence in Europe after the war to help in the re-building and security it is impossible to say if the map stayed in Europe or travelled back across the Atlantic. Either way, the stamps make clear that by 1948 the map had been through four important and different hands. How it then made its way into the collection of a London academic institute, who then donated it and many other maps to the Bodleian in 2015, is unknown, just one more twist in the tale of a simple road map with a fascinating history. This entry was posted in Cartography, History on 14 July 2016 by stuart. July the 1st marks the 100th anniversary of the Battle of the Somme, and with it the anniversary of the day of the greatest loss of life in British military history. Trench maps made in preparation for the battle are shown here, as well as editions of sheets made during the battle itself, which lasted from July to mid-November. A trench map, especially one covering an area of heavy and prolonged fighting, gives a false impression of the land it portrays. Farms and woods shown on the maps would have been the ghosts of buildings and trees long since destroyed by bombardment, and only the heaviest of craters left after detonated mines would be shown, not the shell holes of no mans land. Apart from a few ‘secret’ maps which included both English and German trenches the majority of maps show only the German trench systems in detail. These maps show the incredible lengths that armies went to the defend ground and supply those in the front-line. German trenches have numerous support and communication trenches, fall-back positions and artillery areas and were of a higher standard than their English equivalent, many of which were but a short distance away. Beaumont, 57D S.E. 1 & 2 (parts of). War Office, 1916. These two trench maps are of the Beaumont Hamel and Thiepval areas, both scenes of intense fighting on and after the 1st of July. Comparing the two maps shows how little progress was made in the fighting. 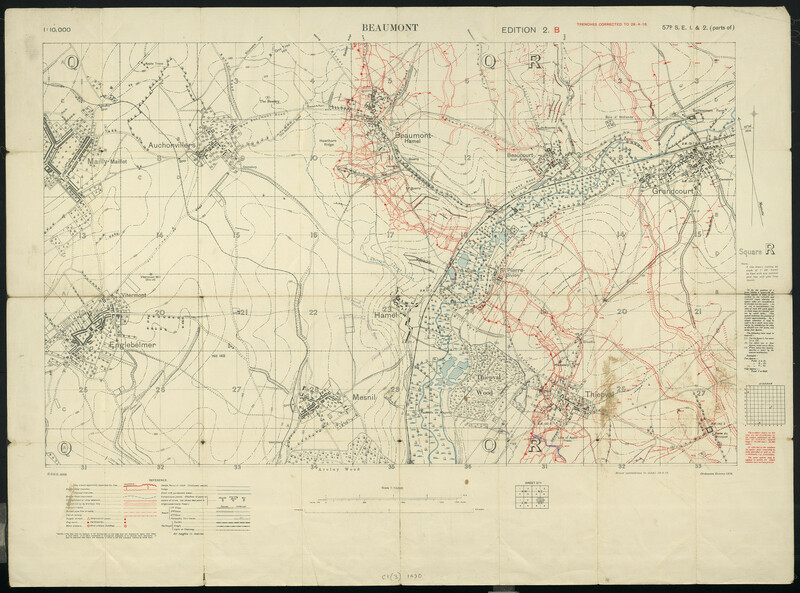 The first map has trenches corrected to 28-4-16, the second corrected to 30-7-16. C1 (3)  and . As German attacks in 1914 and early 1915 came up against stiff opposition they were able to build strong defences behind their front-line, taking advantage of higher ground and then fall back into these positions. Dug-outs were constructed deep into the ground and trenches were lined to prevent flooding. These defences were able to withstand the withering artillery that the British rained down on the German front-line in the days leading up to July the 1st, and as troops went over the top at the given signal German troops were able to lay down a fire which proved fatal to the advancing troops, many of which were from Pals Battalions, formed from towns and cities, sometimes places of work, and fighting for the first time. The enormous loss of life on the first day, nearly 20,000 killed and many more wounded, meant that many communities back in England shared in a collective grief. Trench map development mirrors that of the war. 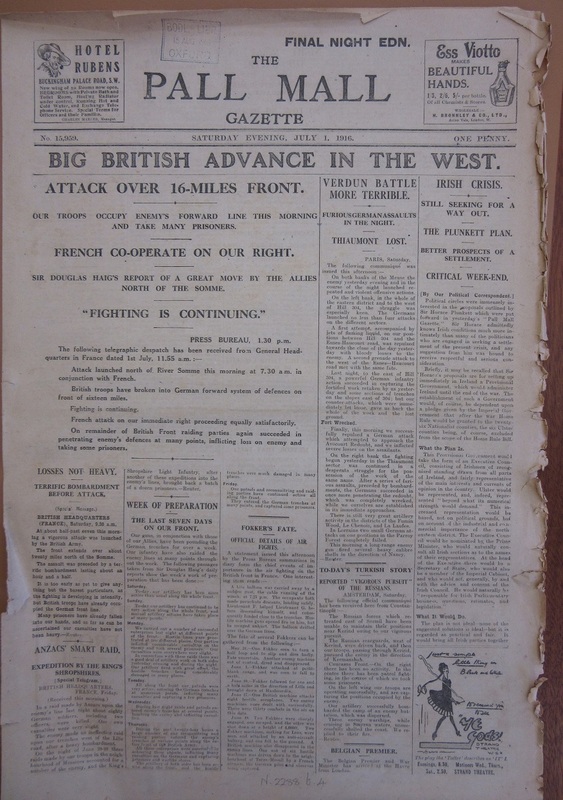 At the out-break of hostilities in 1914 British forces fought an enemy constantly on the move and so less-detailed mapping, French 1:80,000 and Belgian 1:100,000 sheets, were used. It was only when fighting became static with the introduction of trench warfare that more detailed, and more accurate mapping was necessary. These maps were designed for artillery, targets are highlighted in red circles while grids are incorporated into the maps so exact locations can be pinpointed both by Signallers and those manning the guns behind the lines. 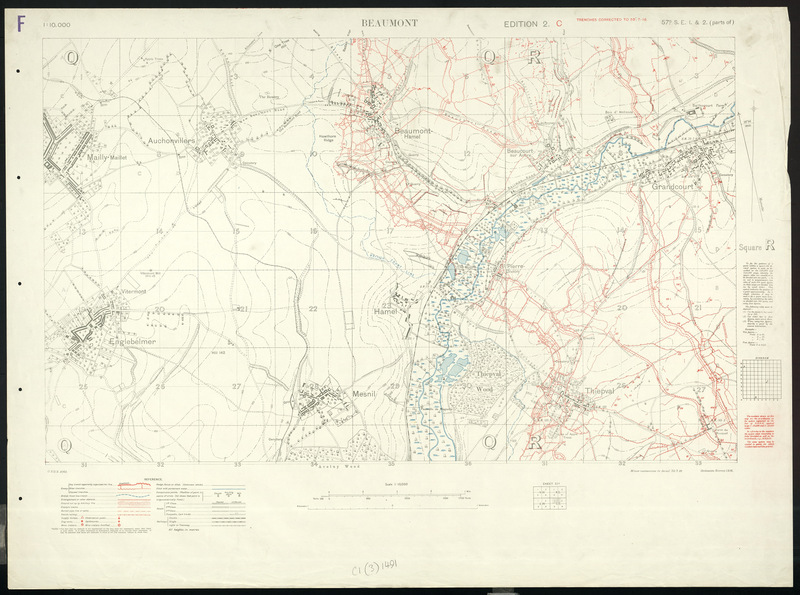 The Bodleian has a large number of trench maps from the First World War. As well as maps by the British there are a small number of German and French maps as well as a large number of maps covering he Gallipoli campaign in both English and Turkish. Along with officially produced maps by the combatants cartographic departments, newspapers and commercial map publishers produced maps for the home market. This entry was posted in History, Military on 5 July 2016 by stuart.